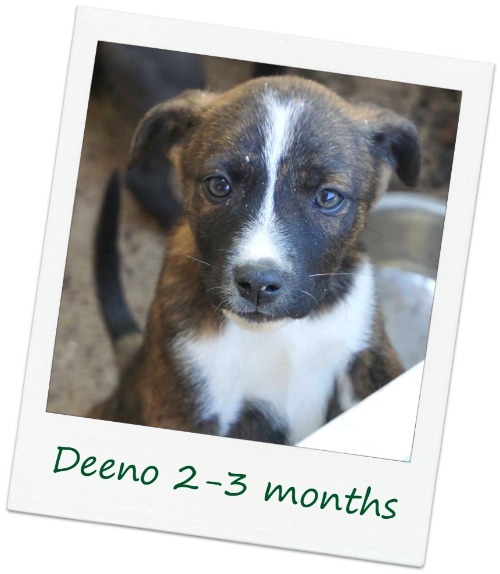 Deeno is an adorable 2-3 month old brindle, black & white Lab/Shepherd mix who weighs about 14 lbs. He enjoys playing with other dogs and is curious about cats. He has approached a cat in his foster home to sniff. The cat didn't like it and swatted at him, but Deeno just rolled with it & walked away. He's a happy-go-lucky pup! Deeno is a really smart boy and is catching on easily to his training. He sleeps through night, is crate trained and close to being completely housebroken. "I absolutely love this puppy and so does my family. He will be a wonderful addition for his loving family. Loves to snuggle. Wants to be with me all of the time. Such a love bug!! Whoever gets to bring him home will be very lucky." Deeno loves to be right near his foster mom and will follow her around from room to room. If even a drop of food falls on the floor, no worries - Deeno has it covered! He's a great kitchen helper.